After a string of teasers over the past month, the world’s first smartphone with an in-display fingerprint sensor has been made official at CES 2018 in Las Vegas. The first to introduce this technology is Chinese phone maker Vivo. Unveiled at CES 2018, the technology is not a prototype but an actual working device that comes integrated with Synaptics’ ClearID in-display fingerprint scanning tech. While it may sound like black-magic, the sensor isn’t much different than your usual fingerprint sensors. When you take Vivo’s new smartphone in your hand, you’ll notice that it’s just a chunk of metal and glass with no fingerprint sensor on the back or even the front. You just need to wake the screen and the phone will explicitly tell you where the finger needs to be placed to authenticate by displaying a graphical fingerprint UI at the very bottom of the screen. If you were hoping to unlock the phone simply by placing your finger in the general area of where the fingerprint sensor resides, well it seems that’s not an option. You’ll first have to wake the device and then scan your finger to unlock. Then, all you need to do is press your registered finger on that impression and voila, the phone has been unlocked. It works in a manner similar to the capacitive fingerprint scanner, but will now make it possible for the phone makers to design more aesthetically pleasing phones. There would no longer be a circular sensor at the rear or front, the ones we’ve gotten used to, and it is a good thing. We did have an inkling of ongoing work in the said department but Synaptics’ in-display sensor was first revealed earlier last year. 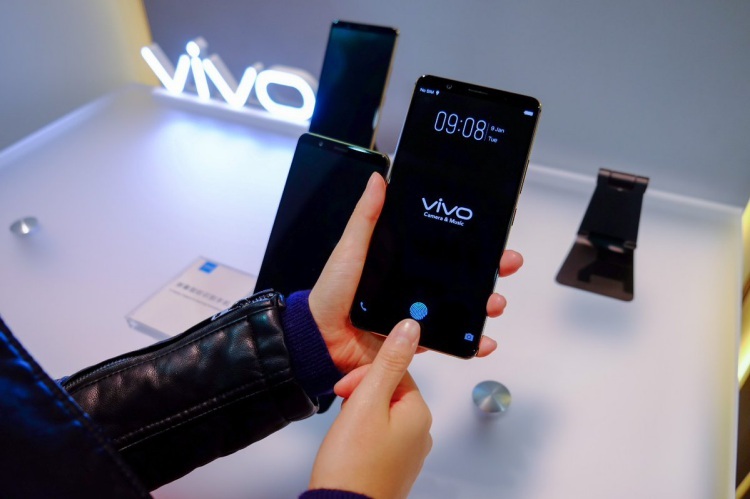 Vivo is just one of the five Tier-1 hardware makers that Synaptics said it is working with to implement the new biometric technology. 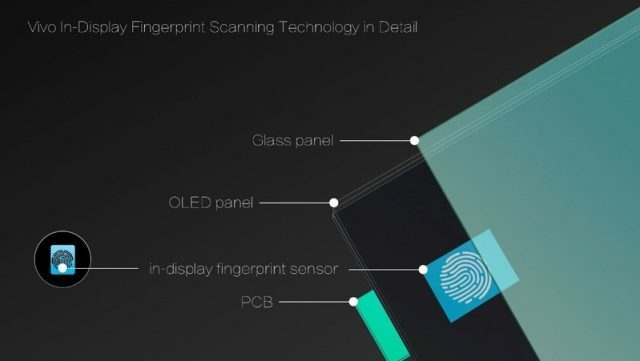 As you can see in the image below, the fingerprint scanner has been sandwiched between the OLED panel and the glass of the display, which would then have been connected to the internals. The in-display fingerprint sensor has an optical image sensor that scans the image of your finger. This data is then passed onto an AI processor that’s said to be trained to recognize 300 different characteristics of your fingerprint. This is core technology which helps the sensor to distinguish between different users. At CES 2018, Vivo has currently only shown the smartphone with its in-display fingerprint sensor. The Chinese phone maker has not shed light on the pricing and availability details for this device but explicitly said that it’ll announce further deets in early 2018. We cannot quote an expected price for the device yet, but the in-display biometric authentication tech could spell the end of separate sensors in 2018. We could see other phone makers adopt this technology, if the implementation does work in the market.